WEATHER - any thing that relates to weather is what we are looking for this time. I went with Wind for my weather themed card. 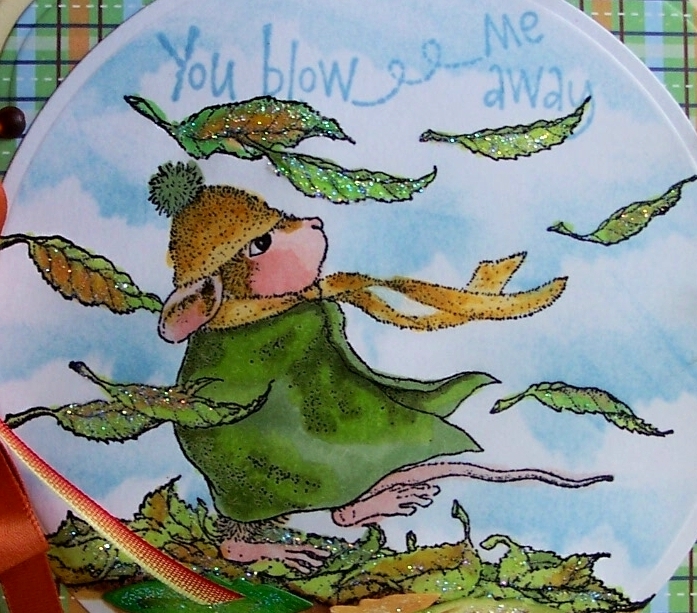 This is a House Mouse Design stamp called Happy Windsday. The rust colored dots are from JoAnn's. Charm from America as a gift. Clouds sponged on using a torn paper towel. We are grateful to our generous sponsors for their support. Please remember, all tax, and shipping is the responsibility of the winner. The design team has come up with beautiful inspiration for this challenge. You can see them on the website, along with complete rules. Hope you can find time to join us for our Weather Challenge. You must use a House Mouse, Gruffie or Happy Hopper image to play. The challenge runs through Saturday May 4, 2013 EST. Awwww such a cute image. Your colouring is fabulous and I really love the layout and gorgeous ribbons. Too cute! Love the touch of plaid! I love this image and your coloring. The shape of the card is pretty too. Great job, Sue! very beautiful card Sue and the card under is very lovely. What a stunning card Sue, I love your design and those stunning papers so beautifully coloured image matched perfectly!!! 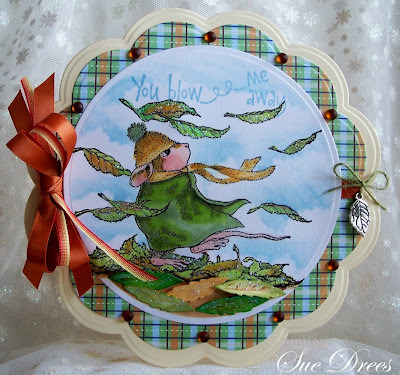 Just adorable, Sue, such beautiful colours and papers. I love the shape and your fabulous colouring!! Such a great sentiment with this lovely image. Darling and so full of fun details. You did a fabulous job! Hugz! Got to be one of my all time fave cards that you have made Sue! The colors so rich, the design perfecto. I do want to learn to do the sky technique-do tell me how to do it! Sue this is fabulous. 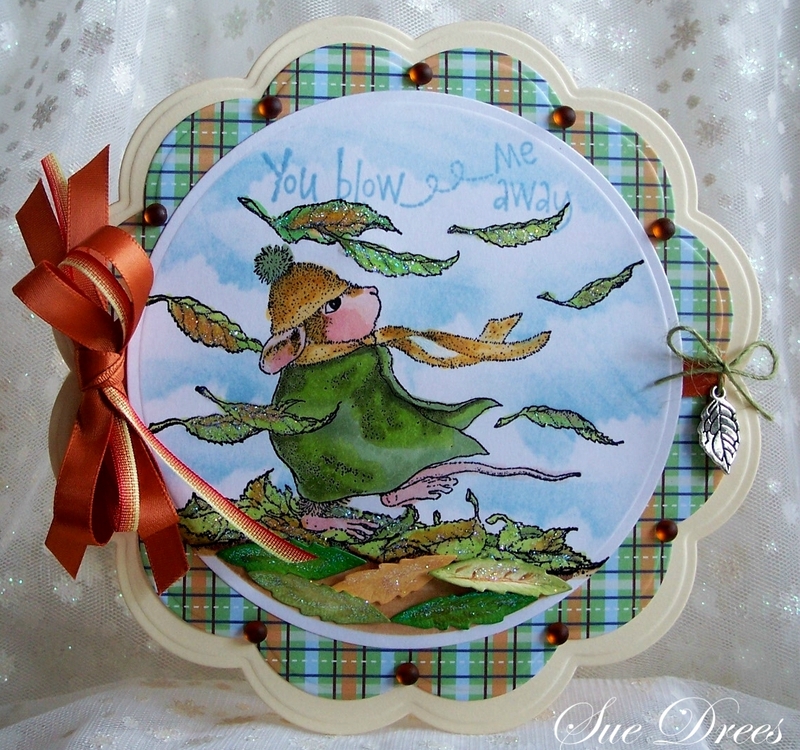 Wonderful little leaf charm, beautiful coloring and awesome round card!!! Sue, I think I have to get this image very soon because the more I see it the more I love it. You did a remarkable coloring job as usual. I love everything about this one. I finally finished rearranging my room so hopefully tonight or tomorrow I can get started on my "weather" card. We are having a misty, damp day today. Hoping for better weather very soon. Fabulous!Love the whole card but I especially love your clouds, they are amazing.